In the past few months, I have been told many more-interesting facts about myself than my Social Security number. 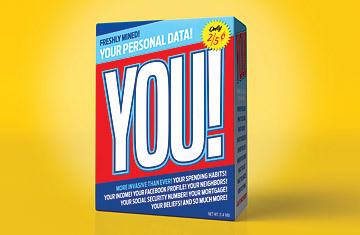 I've gathered a bit of the vast amount of data that's being collected both online and off by companies in stealth  taken from the websites I look at, the stuff I buy, my Facebook photos, my warranty cards, my customer-reward cards, the songs I listen to online, surveys I was guilted into filling out and magazines I subscribe to. Google's Ads Preferences believes I'm a guy interested in politics, Asian food, perfume, celebrity gossip, animated movies and crime but who doesn't care about "books & literature" or "people & society." (So not true.) Yahoo! has me down as a 36-to-45-year-old male who uses a Mac computer and likes hockey, rap, rock, parenting, recipes, clothes and beauty products; it also thinks I live in New York, even though I moved to Los Angeles more than six years ago. Alliance Data, an enormous data-marketing firm in Texas, knows that I'm a 39-year-old college-educated Jewish male who takes in at least $125,000 a year, makes most of his purchases online and spends an average of only $25 per item. Specifically, it knows that on Jan. 24, 2004, I spent $46 on "low-ticket gifts and merchandise" and that on Oct. 10, 2010, I spent $180 on intimate apparel. It knows about more than 100 purchases in between. Alliance also knows I owe $854,000 on a house built in 1939 that  get this  it thinks has stucco walls. They're mostly wood siding with a little stucco on the bottom! Idiots. EXelate, a Manhattan company that acts as an exchange for the buying and selling of people's data, thinks I have a high net worth and dig green living and travel within the U.S. BlueKai, one of eXelate's competitors in Bellevue, Wash., believes I'm a "collegiate-minded" senior executive with a high net worth who rents sports cars (note to Time Inc. accounting: it's wrong unless the Toyota Yaris is a sports car). At one point BlueKai also believed, probably based on my $180 splurge for my wife Cassandra on HerRoom.com, that I was an 18-to-19-year-old woman. RapLeaf, a data-mining company that was recently banned by Facebook because it mined people's user IDs, has me down as a 35-to-44-year-old married male with a graduate degree living in L.A. But RapLeaf thinks I have no kids, work as a medical professional and drive a truck. RapLeaf clearly does not read my column in TIME. Intellidyn, a company that buys and sells data, searched its file on me, which says I'm a writer at Time Inc. and a "highly assimilated" Jew. It knows that Cassandra and I like gardening, fashion, home decorating and exercise, though in my case the word like means "am forced to be involved in." We are pretty unlikely to buy car insurance by mail but extremely likely to go on a European river cruise, despite the fact that we are totally not going to go on a European river cruise. There are tons of other companies I could have called to learn more about myself, but in a result no one could have predicted, I got bored. Each of these pieces of information (and misinformation) about me is sold for about two-fifths of a cent to advertisers, which then deliver me an Internet ad, send me a catalog or mail me a credit-card offer. This data is collected in lots of ways, such as tracking devices (like cookies) on websites that allow a company to identify you as you travel around the Web and apps you download on your cell that look at your contact list and location. You know how everything has seemed free for the past few years? It wasn't. It's just that no one told you that instead of using money, you were paying with your personal information. See how college-admissions departments stalk Facebook. See how one teacher's viral blog post sparked an angry debate.